Carrera commemorates Porsche’s success in the Carrera Pan American Race. Porsche developed its first 4-cam racing "Carrera" engine for the 356 in 1955 known as the Porsche 356 Carrera. The name was synonymous or high performance race cars, but modern day has become a luxury flagship for Porsche and in my opinion is what built the brand into one of the most famous automotive names. The first Porsche to be called a Carrera was the 904. 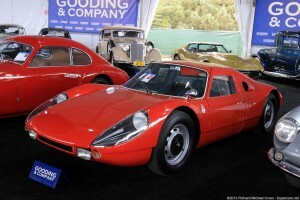 Unable to market the car as the internally name 904 because of similar Peugeot models, the vehicle was called Carrera GTS and featured lightweight chassis made of fiberglass and welded steel tubing. Most 904’s were painted silver reminiscent of the unpainted aluminum bodies of past German race cars. The 904 was initially produced using the 2.0 liter Flat-4 4-cam Carrera engine producing 180hp and later fitted with a Flat-6 2.0 liter 210 hp engine later sued in the 911S. A few Factory race cars were fitted with 2.0 liter Flat-8 engine producing 240hp. All configurations used a 5-speeed transaxle, 4-wheel independent suspension and 4-wheel disc brakes. No other Porsche has yet to be called “Carrera”, but the Carrera name lives on as a level of performance for the Porsche product line. The 904 was introduced in 1963 after design work by Ferdinand Alexander “Butzi” Porsche, Ferdinand Porsche’s son, weighing a mere 1,600 lbs and being capable of 0-60 in 5.5 seconds and a top speed of 163mph.